This was my first attempt at fondant. 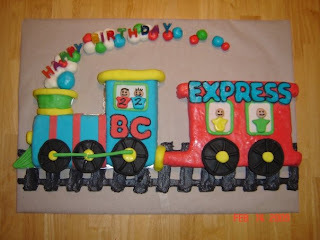 This was my boys' 2nd birthday cake made of rice krispie treats. One of my boys has severe food allergies to egg and nuts so he can't have regular cake. Rice krispies worked very well and tasted delicious. You can order this cake for $70. That price includes two cars worth of cake or rice krispie treats at $35 per car. Each car is roughly 12 inches long and 9 inches tall.